If sleep is scary for your child, chances are your family isn’t feeling very well rested. Nightmares and night terrors are fairly common in early childhood. While many people will use the terms interchangeably, nightmares and night terrors are, in fact, very different events. In my work as a Child Sleep Consultant I’ve found that parents feel a sense of mystery regarding both nightmares and night terrors. 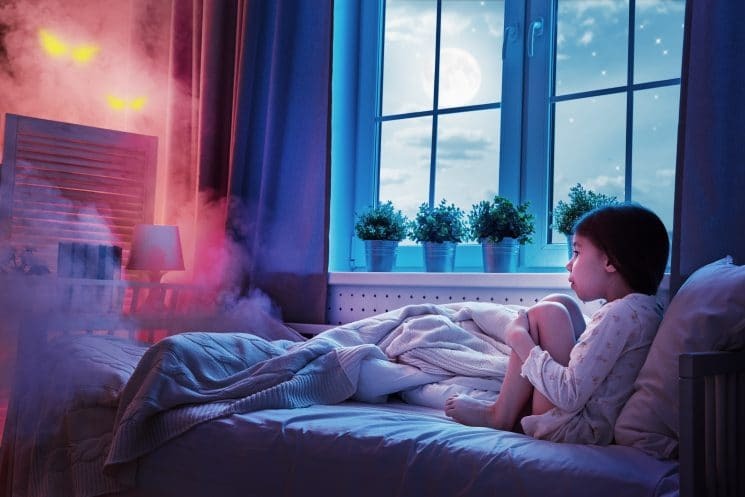 Here’s what you need to know if your child is having nightmares or night terrors and some tips on how to make sleep less scary for your little one. Nightmares are a normal part of child development and they tend to increase in frequency between 2-3 years of age. 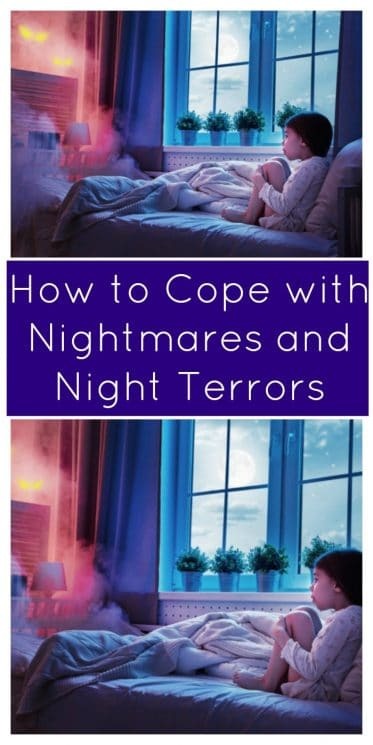 Nightmares are most common during periods of change or stress and are usually caused by being overtired but sometimes occur for no particular reason. Nightmares are scary dreams which occur during REM sleep. After the nightmare has ended your child will wake fully and seek comfort from you. Nightmares usually occur during the second half of the night when dreams are most intense. Your child will cry or appear frightened even though she is fully awake and the dream is over. If prompted, your little one will be able to recall what happened during the nightmare. Do a sweep of your little one’s environment- take out anything that could cause fear. Look at TV shows, books, games, etc. It’s best to avoid them during the day and in the evening. Respond quickly, offer reassurance and encourage your child to go back to sleep. Use an early bedtime to ensure your child is not overtired. Don’t feed the fear by using monster spray or checking under the bed. This only confirms for your little one that monsters are indeed real. Validate your child’s feelings while encouraging independent sleep. Avoid discussion of the dreams. Don’t ask what happened, especially in the evening. Night terrors occur in only about 5% of children and more frequently in boys than girls. They usually begin in early childhood and can last into the school years. A night terror is a partial arousal from very deep, non-dreaming sleep. A night terror can be brought on by a fever or by a disruption to the child’s normal sleep schedule. The term ‘night terror’ accurately describes the child’s behaviour during the event. Parents are alerted as their child screams, thrashes and panics. She may jump out of bed and run wildly as though being chased or trying to escape something. If you happen to witness your child having a night terror you will notice that she will not acknowledge your presence when you go to her, instead it will feel as though she’s looking ‘through’ you. Night terrors usually occur one to four hours after falling asleep when non-dreaming sleep is deepest. Wild behaviours such as thrashing, screaming and moaning will all disappear when the child wakes in a calm state. Think about safety in the sleep environment. Remove clutter and any objects that could be unsafe during an event. Consider placing a gate at the top of the stairs to prevent falls. Monitor the child for safety during the night terror but don’t interfere because this will intensify the episode. Trying to interfere with the event can actually make it worse by increasing the duration and intensity. Stay calm and place your child back in bed once the night terror ends. Avoid discussion about the night terror the next day as your child will have no recollection of the event. This will only create confusion and anxiety about sleep. Protecting your child’s sleep needs is key in preventing night terrors. Children who experience night terrors are extremely sensitive to getting less sleep or a change in their sleep schedule. My grandson is 9, very intelligent, into all the boy things etc. He has a very vivid imagination and a creative mind, so it is quite surprising that he can quite easily be “spooked”, on occasion, by aliens and zombies that he may have seen on a film, even though he lives in a world of weird things. He is sometimes troubled at night, and a bit scared. What do you suggest for the older child? My daughter had night terrors almost every night from about 2.5 – 4.5 years of age. She’d scream like nothing I’d ever heard, thrash wildly throughout the house, kick, etc. I’d have to restrain her with nearly my whole body to keep her from hurting herself. We tried everything suggested in the literature and by docs. Nothing worked–it rarely failed that about 1 hour after going to sleep she’d have a terror. I started having her sleep with me because it made dealing with them easier. She started having restless legs/periodic limb movement, as well. I began researching this and found a link between parasomnias (which restless legs & night terrors are considered) and too much calcium leading to malabsorption of iron. My daughter was drinking at least 20 ounces of milk a day. I cut it back to no more than 12-16 ounces and she’s never had another night terror (or troublesome leg movements). Of course this might not be the issue for all kids who have night terrors, but I’d have given my right arm to have heard this information 2 years earlier than I did! My three year old has nightmares and wakes up crying or just starts yelling for us. We encourage her to go back to sleep but she doesn’t. It has taken between 1-2 hours to get her back to sleep. We will lay with her for a little while but soon as we leave she freaks out and we are back to square one. Any suggestions on how to get her to go back to sleep without throwing a tantrum? This has been happening every single night for 2 weeks now and we are very exhausted and frusterated.